Chores are all well and good – unless your child won’t do them. Last week I wrote a post on the benefit of having simple routines. One of my best simplifying tools is a chore chart. Each child knows the task they must accomplish in the morning before school. We all pitch in and most days it works pretty well. On the weekends, we all do more substantial chores to keep the house a bit more pulled together. These are my quick thoughts this morning as I get ready to wake my kids and start the morning rush. 1.| Consider how long your child has been home. If your child is new to the family and you’re still adjusting to life, keep it simple. If chores make the child feel she is part of the team, by all means, do chores. If chores trigger big feelings or behaviors, save them for later. Learning to trust you to meet her needs, finding her place in the family, staying close to your side and helping you with your work is all more important than accomplishing independent chores. 2.| If chores cause rages, it’s not a battle worth fighting, especially before school. In our family, we learned it was important to keep Kalkidan’s before-school routine as short and simple as possible. The fewer triggers (including words) the better. We figured out how much time she needed to get dressed, make her bed, do simple hygiene, eat, and get out the door, added a little bit of wiggle room, and that’s how much time we allowed for her morning routine. When she was little, I woke her at the right time. When she was older, she was allowed to leave her room at the right time. The fewer interactions she had with siblings during the before school rush, the better. We tried to keep her mornings calm, which was a challenge. Eating a good breakfast was FAR more important than completing a chore. An after-school chore done side-by-side with a parent may work better for a child who is more easily dysregulated. After dinner help (which we don’t assign, but do together as a family) is also a good option. 3.| Set the bar low enough for success. I love a clean house and I really want my kids to do a good job on their chores, but I also try to be realistic. Some kids are more detail oriented than others. Some are anxious in the morning and in a hurry to complete it, others are perpetually distracted or running late. I try not to be too uptight. In many ways, I’m trying to help them form good habits, as well as keep our house from slipping into a complete mess. I want them to learn a dishwasher really can be quickly emptied, a bathroom can be wiped down in just a few minutes, the family room can be vacuumed in the same amount of time it takes to complain that it’s just not possible to get it done. A house cleaned imperfectly is still cleaner than one not cleaned at all. Saturday chores are done more carefully and thoroughly, I also check them more consistently! 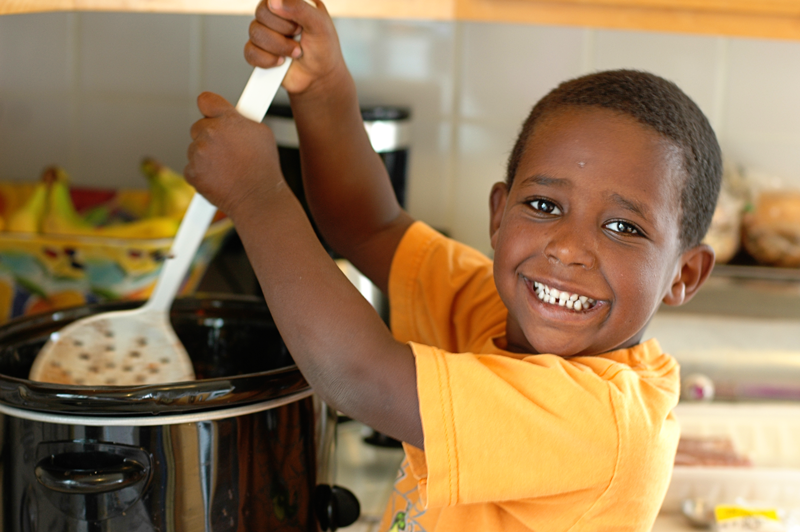 If you have a child who is easily dysregulated over chores, you may want to offer choices. Depending on your family size, you could say, “Would you like to empty the dishwasher or sweep the kitchen?” In my house, we have a chart for multiple kids, so that wouldn’t work well for me. I also don’t currently have a child who struggles with which chore they need to do. Doing a chore at all can be a problem – but which chore they do is not the issue. When all else fails, I give kids the option to do their chore after school rather than before. If my teens have big plans for the weekend, I give them the fun choice of doing their Saturday chores Friday afternoon or even Thursday evening – they love that. I’m a super nice mom that way. Right now I have a child who wants to leave for school as early as possible and we have to place restrictions on how early the vacuum can be turned on in order not to wake siblings. I won’t go into the details of this, because, believe it or not, it’s actually complicated. I’ll just say, parenting is hard and sometimes it bends my brain in too many directions. 5.| Focus on what matters most. If you are really struggling with your child, and you are simply trying to survive each day, forget about chores. If you can afford it, hire somebody to clean your house and lift as much off your shoulders as possible. Take care of your child’s most basic needs for food and love, and take care of yourself. You may have so many appointments for medical care, therapies, and school meetings for your child that you can hardly breathe. Be sure some of those appointments are for you too. Find a therapist to help you process your own trauma and grief. This is hard work, friend – such hard work. If you need to see a doctor to treat depression or anxiety, make an appointment. Take care of your spiritual needs. Join a Bible study or go to church; a sweet friend of mine goes to daily Mass twice a week for her own sanity and faith. Go outside and take a walk – breathe. Find one good friend who understands you and call her regularly. All for today, friend. I hope this is helpful for you if your kids are struggling and you are deep in the hard stuff with them. Remember, our kids regulate to us, they can’t calm if we aren’t calm with them. Let go of anything that isn’t absolutely necessary and do all you can to keep yourself calm, breathing, and as present as possible. Take good care of yourself, friend. With love, courage, and hope in the journey. Thank you. Especially for verbally saying that we have permission to NOT always do the “right” thing when it causes so much discord. We have recently made a concession to the no tv in the morning rule. If desta completes all her morning needs shout complaint or screaming, she can watch one show. I wrestled for so long letting her do this. It goes against everything I have believed in as a mom. However, what I am learning as Desta’s mom is that she has different needs than my other two bio kids did. It’s hard to surrender what I feel is right in order to do what she needs. Your last paragraph spoke especially to my heart today. It’s so important for us to remember that our kids’ brains are wired differently due to trauma. Their needs are truly different and as much as we want to parent the way we always have, it simply may not be possible. I remember when the therapist said we should let Kalkidan watch tv after school as a transition before homework. TV? Are you kidding? And chew gum in the house? No and No. But those answers became “sometimes” and “yes.” We had to change so much. Press on, Melody, press on. Oh these are great Lisa!!! Just perfect timing for me as in the last 3 days has included: chest pain, Blood work, ekg, x-rays, referral to orthopedic dr., cat scan, immunizations & sore throat between 4 kids. Messy house vrs. connecting time…..Connecting WINS!!! Oh my – that’s so much to cope with! Hang in there, Angie.